I love washing my hair even if it does take up a lot of time, I like standing in the shower as well as my hair feeling clean and fresh! 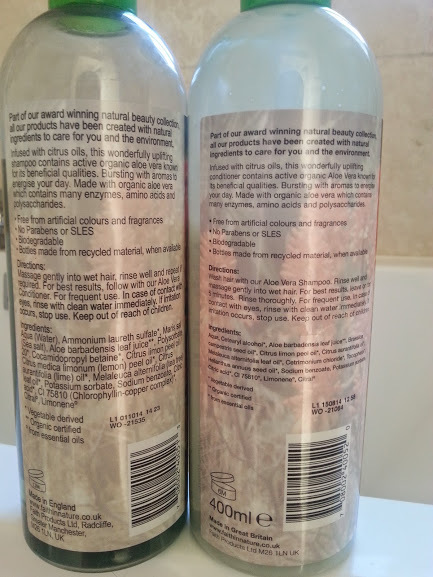 Since becoming a blogger I have become a lot more aware of the nasty things that are put in products but didn't realise just how many of them are in hair products! 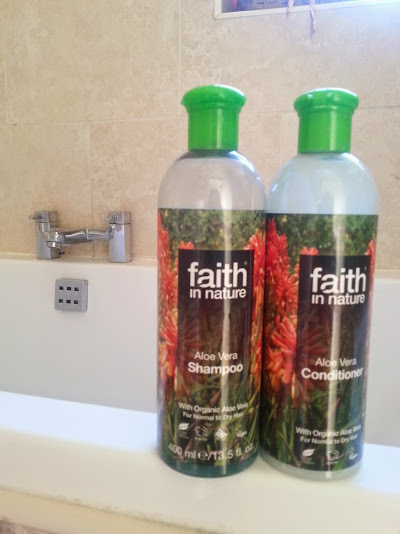 I was recently contacted by the lovely people at Faith in Nature to review their shampoo* and conditioner range and I immediately jumped at trying out the Aloe Vera range because I am obsessed with the smell and the plant in general. 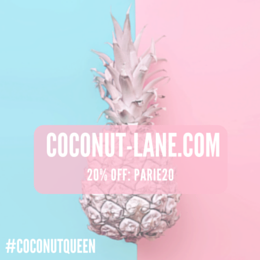 They are a brand that are all natural, they don't use anything horrible in their products and offer body care as well as hair care, so maybe take a sneaky peek at their website to discover more. The bottles are 400 ml each and retail at £5.35 each which is a whopper of a bargain for the amount you are getting. The packaging isn't very out there but should that really matter if the product inside is amazing? I've been using the two of these* combined for over a week and a half now so that's around 6 times in total and lemme break it down.. Smell - The smell of a hair product is the most important to anyone I think, you're hair has to smell nice. This set of products have a citrus smell to it, very lemon like but not too strong that it burns you're nose when you smell it. Texture - At first the shampoo was really runny and watery but after a good shake it was a little better and lathered into a soapy shampoo that filled my hair with freshness. Following up with the texture much more thicker in texture, I used it on my ends and my hair felt/feels so soft! I love the feeling of it, sometimes conditioner can feel really oily and I hate it but this is different. Afterwards - After drying my hair I was left with volume, and my hair feeling super soft it was as though it has stripped it of everything bad and left a lot of good it in! My mum who has thick, curly hair also tried both the shampoo and conditioner and she has fallen in love with them! She loves the smell of them on her hair afterwards and the way it feels in her hair and she is a lover of thick conditioners as they do the job well! If you want to look at the full range of products faith in nature have to offer, check them out and let me know if you fancy any of their shampoo scents they have chocolate, pineapple and grapefruit!